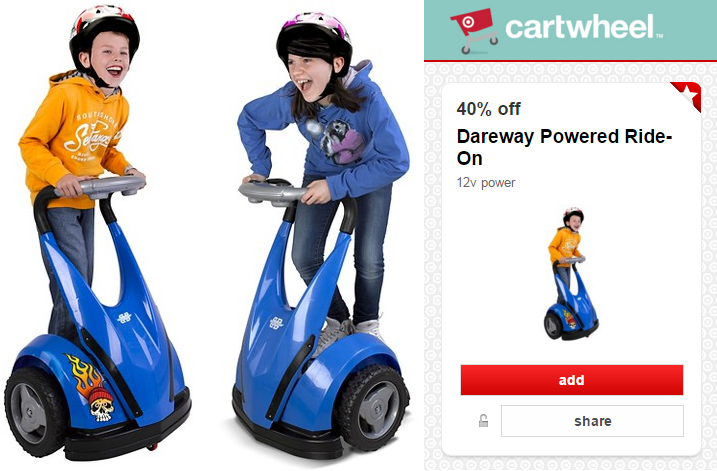 Save 40% Off Dareway Powered Ride-On With Cartwheel Offer at Target! The kids are set for Christmas but I was scrolling through my Target Cartwheel app and came across an amazing offer! Right now through December 19th, you'll be able to save 40% on a Dareway Powered Ride-On! This is originally priced at $179.99. With the cartwheel offer, it'll bring it down to $107.99. If you go anywhere else, you'll find it for $219.99, so your best bet is to get it now at Target! If you have a Target redcard, you'll save another 5%! The suggested age for this is 6 and up.